The connection series is an ongoing body of work that uses wires as a visual metaphor to the ties that bind us in relationship. These images take the subject matter out of its usual context by excluding buildings, trees, and any recognizable landmarks. What is left is an isolated pole floating in a void with wires stretching to, or from, the edges of the frame. They might be telephone wires transferring information, electrical cables supplying energy, or tension cables providing support. 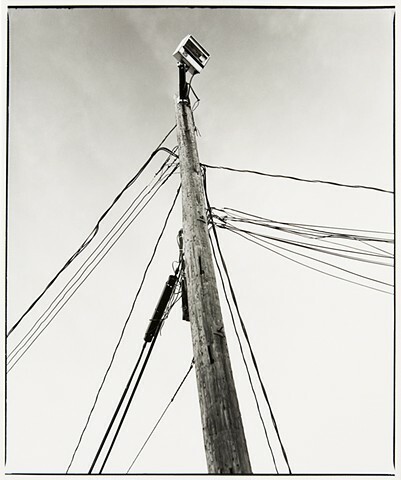 I attempt to personify these poles and suggest the influence these strings have on the composition of our lives. Many of the connections are necessary such as family or cultural influence. Others are more flexible and can be subject to our wills, such as maintaining old friendships, or saying hello to a stranger. Each relationship or connection opens up a realm of possibilities that can be explored or terminated on either end. In our journey, birth to death, we shape our identity through our experiences, our innate selves, and the nuances of our intimate relations.